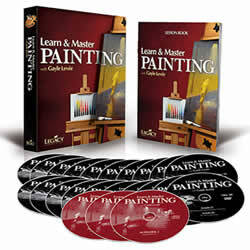 Mona Lisa painting and more Leonardo Da Vinci art history part 2. 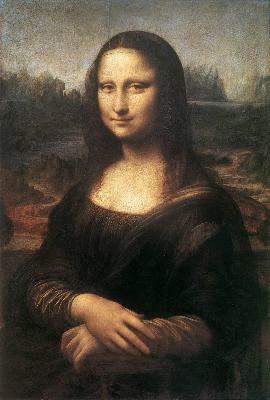 So lets start with The Mona Lisa Painting, what is considered the worlds most famous painting! So much so, he made sure it traveled with him where ever he went until his death in France. He never divulged who the sitter was, or the actual name he gave the painting! Some question that there may not have even been a sitter and some propose it is a self portrait. Strange, yes, but the story’s that have happened since are even stranger. The “Mona Lisa” name was credited to Giorgio Vasari, (an Italian painter and author), for whom he thought the sitter for Leonardo was (nearly 50 years after the fact). This guy was known to weave a good yarn, and thus, the mysterious Lisa Gheradini, a young wife of the Florentine Merchant Francesco Del Giocondo story was born. Giorgio has also has been attributed to a great many other strings to the web of things that clouds the mystery behind this most famous painting in the world. But let us move on. We know Mona Lisa painting is a 16th century portrait painted in oil on a poplar panel (during the Italian Renaissance). The work is owned by the French Government and is on the wall in the Louvre in Paris, France. I’ve been there once to view it, and because of the crowds, security plexa-glass and a fairly far reaching security border of red rope with guys standing around with mini machine guns, you have a better chance at seeing it right here! All of this didn't exist in the early 1900's cause a guy in 1911 stole the Mona Lisa painting from the Louvre. The thief actually hid in a broom closet until the museum closed, picked the painting off the wall, and walked out the front door with the painting under his jacket! Eduardo de Valfierno was the mastermind behind the theft and had planned to make copies of the original and sell them as the real thing. In 1913, he was caught trying to sell the original to a Florence art dealer. Now didn't I see that in a movie somewhere? The painting is of a half-length portrait depicting a woman whose expression has been explained as enigmatic, which means, having a quality of mystery and ambiguity and so difficult to understand or interpret. In other words, its hard to understand. It’s the same expression my wife gives me when she knows I don’t know, but I think I know, if you know what I mean! I think she knows a lot more than she’s letting on! 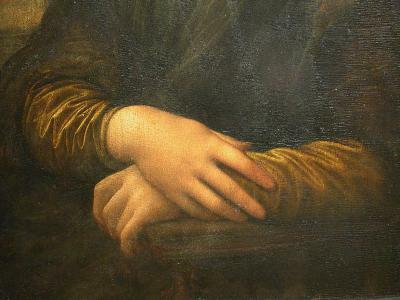 Leonardo uses a pyramid style composition to place the woman in the painting. Her breast, neck and face have a highly diffused lighting. No stark shadows and contrast, but a calm glow over the whole piece. The armrest acts as a barrier between you and the sitter. She sits rather upright, as if ready to answer your questions, but it’s her gaze that compels you just sit along side her and wonder what’s she thinking about. Her crossed arms are telling you to keep your seat and not engage her directly, but just you sit tight and enjoy this fleeting moment. It is said that because her right hand rests on top the left depicts a virtuous woman as would a wedding ring. My knowledge in this area is sparse so I’ll take their word for it.She has also no visible facial hair. Common it was to remove (tweeze) away eyebrows and eyelashes as it was viewed unsightly. What a shame! This painting is one of the first known to depict a person in front of a landscape. Give Leonardo credit to think outside the box. The faint smile in her face helps us to feel the overall harmony achieved in the painting and in connecting humanity and nature within the same piece. No wonder Leonardo fell in love with the Mona Lisa painting, and never let her out of his reach. 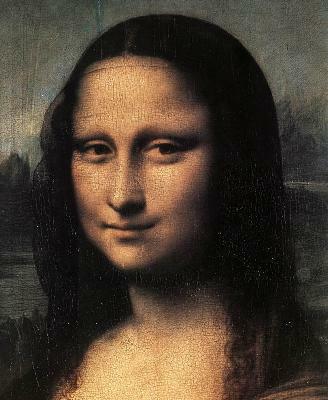 I hope you've enjoyed this article concerning Leonardo Da Vinci's the Mona Lisa painting! And now, are you ready to get into some real de-codifying of the "Da Vinci code"! Click here to get the rest of the story on Leonardo Da Vinci's The Last Supper, decoded!